Wow, nearly four months since I last posted. That's not good. It's been a strange few months: a bad case of blogger's block and inspiration inertia, and an exceptionally frantic period at work meant that blogging has taken something of a back seat. I've also been eating terribly badly over the last few months, and you really don't need to see the pictures of empty Dominos boxes to prove it. But I haven't completely given up on this little blog. I have still been cooking and photographing recipes - some good, some less good. I might even put some of them up here. For now though, here is a little treat. I can't claim any originality for it I'm afraid: my sister made this as a starter when I went over to see her recently for dinner. A girl's night in turned into a more social affair last week, and I hadn't planned on cooking much but thought I ought to make an effort. This was both easy and extremely delicious. It also looks pretty impressive. Snap the tough stems off the asparagus then steam for four minutes. Arrange four spears to a plate, neatly arranged in a row. Drizzle with a little olive oil and lemon juice, and season with salt and pepper. Next, put some water on to boil for the quail's eggs. 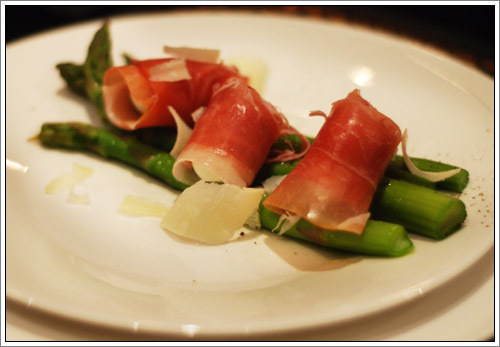 While you are waiting for the water to boil, tear the Parma ham in half lengthways and set aside for the moment. To soft boil the quail's eggs, place in gently boiling water for a minute then leave to stand for a further minute (boil for three minutes if you prefer a hard boiled egg). Run under cold water to cool, then peel off the shells and wrap each egg in half a strip of Parma ham. 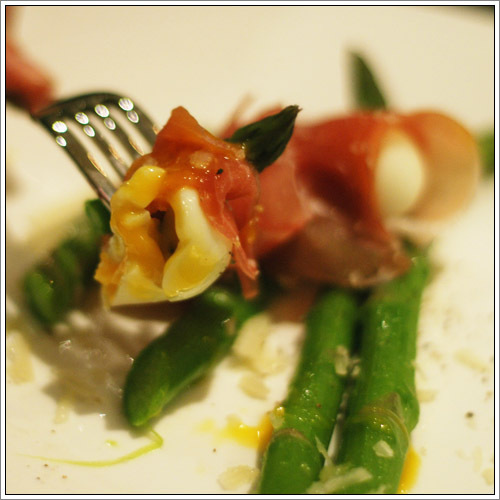 Place three Parma ham wrapped eggs on each plate, and devour immediately - it is as its best when the eggs and asparagus are still slightly warm.